Produktinformationen "Whisky Couvreur - Clearach"
Der Clearach aus dem Hause des renommierten Spirituosen- und Whiskyhersteller Michel Couvreur, ist ein sensationell makelloser Single Malt aus Schottland, der als First Fill in besonders alten Sherry Fässern seine einzigartige Erhabenheit und Vollendung findet. Mit original schottischem Wasser des Loch Katrine wird der Clearach auf 43% Alkohol reduziert. Er ist ein junger 3 Jahre alter Single Malt mit wunderbaren Mandelaromen und einer besonders eleganten, grassartigen Frische, die nur die Gerste produzieren kann. Das Aroma diese genialen Whiskies präsentiert eine wunderbare, fruchtig-aromatische Sherrynote. Am Gaumen entwickelt sich die Süße, leichte Rauchnoten, Toffee, Fudges und auch Marzipan. Neben der Trockenfruchtaromen macht sich auch die wollige, würzige Wärme des Sherrys deutlich erkennbar. Clearach is generally the name of a Scottish spirit during its three first years in the cask. 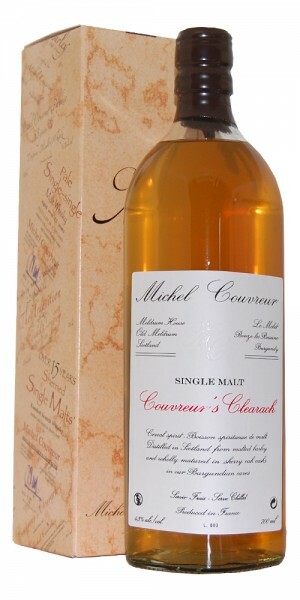 COUVREURS CLEARACH is a single malt distilled in Scotland and matured between 2 and 3 years in wine fresh sherry casks. It has been reduced to 43% alcohol by volume. Very clear amber tint. Typical to very young malts with almonds and frangipane (red jasmine) fragrance, nice grassy freshness with a slight touch of honey. Lively in the mouth, its maturation in wine casks, despite its young age, is revealing some silky elegance. Possessing young spirits intense and lively characteristics, it displays the flavours of first vinous impregnations. To be consumed as an aperitif or as a Norman Hole (the traditional Norman intermezzo made of one single shot of strong Calvados between two heavy courses).